The minutes of our AGM held last Friday night will be circulated to all members very shortly, but I think it fair to say that everyone found the procedings informative and enjoyable. Paulien Wood (Membership Secretary) & Helena Fensome (Social Secretary) stood down from the committee having given the maximum five years service and we thank both of them for their tireless efforts on our behalf. The remainder of the 2012 committee were re-elected including Harry Midgley who had been co-opted during the year, and they were joined by Raghu Iyer for the 2013 season. Immediatly post the AGM, the new committee retired and Chris Roberts was elected by them as Chairman, Derek Whittingham as Secretary, and Hugh Crook at Treasurer. Other posts will be decided at the first committee meeting in a few days time. Our Prizegiveing Dinner that followed was another success and happy event. 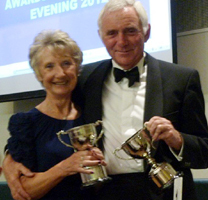 Ian Norris scooped the biggest hoard of cups as together with partner Delia Norris they 'cleaned up' in all the 5+ & 7+ competitions. But the undoubted 'star of the show' in winning the top competitions at both AC & GC was Charile von Schmeider - undisputedly he is our CLUB CHAMPION. and as one of the longest serving members was elected to honorary membership in 2010. He partnered Brian Bucknall over many years in the association croquet Caversham Plate competition which they won on three occasions. Norman and his wife Freda also played occasional golf croquet. Norman was a Grammar School boy from the Welsh Valleys. His 18th birthday occurred on 3 September 1939. Following the outbreak of war Norman volunteered for the RAF but was directed to Cardiff University to read medical sciences and pharmacology. 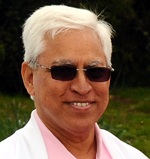 Upon graduation he was directed to work in the School of Hygiene and Tropical Medicine. Here he was much engaged on research into penicillin and other antibiotics with Sir Alexander Fleming and Professor Raistrick and was awarded a PhD. After the war Norman worked for several pharmaceutical companies mainly in the field of antibiotics and travelled widely in Europe and America. One of his new antibiotics was successfully tested on the family cat. He and Freda married in 1947. They had met when Freda was evacuated to Wales from South London and sang in the local chapel choir where Norman’s father was organist and choirmaster. Norman and Freda first lived in Sutton and Cheam. Here they were active in the local Baptist Church. Norman was involved with the church’s youth work where he mentored disadvantaged boys. He was highly delighted a few years later when one became an Oxford professor. Their two boys were born in the later 1950s and the family moved to Emmer Green, Caversham, during the bitter winter of 1963. In due course the boys attended Reading School. When proposals were announced by the local council that the school along with its sister school, The Kendrick, were to go comprehensive Norman took the lead in organising an action group to preserve the schools’ grammar school status. This included obtaining signatures from many thousands of parents, prospective parents and other interested parties culminating in a meeting with Margaret Thatcher, the then Minister of Education. The schools were saved. Following the move to Caversham, Norman and Russ became active in the Church of All Saints, Dunsden, where Norman sang tenor in the choir almost until the time of his suffering a stroke in the summer of 2012. Norman was a very competent yet unassuming friendly man whose presence we shall greatly miss. With the offices of Chairman, Secretary and Treasurer decided immediatly post our AGM, our other committee posts were decided at it's first meeting. The only changes to the 2012 committee see Harry Midgley as Courts & Equipment Officer and Raghu Iyer as Memebership Officer. 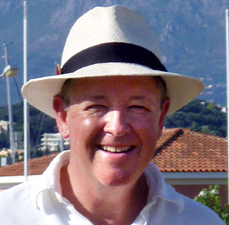 Chris Roberts was elected as Chairman of the Southern Croquet Federation at it's AGM. Frances Colman will continue as i/c Golf Croquet. These appointments see Phyllis Court at the very heart of the region's croquet administration. Nearly all of our AC players attended a meeting organised by Brian Bucknall to discuss plans for next season. There was good enthusiasm for all the current competitions and tournaments, as well as news that a new 'tripple peel' series would be tried. In line with the committee reccomendation, all competative croquet will conform to the CA 'Tournament Regs' from now on (with the slight alteration that ties in season long block competitions will be decided by a play-off game). 27th December - Worst floods yet!